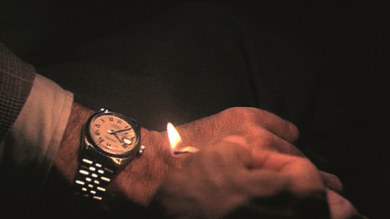 A few weeks ago I went to see Christian Marclay’s new work, The Clock, at LACMA. A departure from his more well known role as a sound artist/turntablist, Marclay’s The Clock is a 24 hour film, synchronized to the local time of the location at which it is screening. It is a collection of brief moments from thousands of films, assembled into a narrative which seemingly places time itself as the main character. Every single moment is related in some way to time, and as such, the viewer is unable to avoid thinking about the passing seconds. Suspense begins to be built upon the minute hand, with a series of climaxes occurring every hour on the hour. For someone obsessed with the concept of passing time (like myself), it’s a pretty awesome experience. What Marclay has created is essentially a cinematic mash-up. Despite the fact that the medium is film, it is still composed like a piece of music. He is sampling video rather than audio, but they’re still samples and they function in the same way. Seeing a “sample” you recognize brings in a flood of personal associative meanings and their juxtaposition creates new connections between them. I suspect that this results in each viewer having a rather unique viewing experience. It’s like the visual equivalent of a Girl Talk song. I may recognize half the samples, while you recognize a completely different set of samples, and thus, the work can mean one thing for you and another thing for me. The film was shown in its entirety during its opening weekend, and is currently screening during museum hours until July 31st. LACMA has also just announced that the film will be shown again from beginning to end on Thursday July 28th starting at 5:00p.m. The screening will take place in the Bing Theater and is free (seating on a first come first serve basis). More info can be found here.